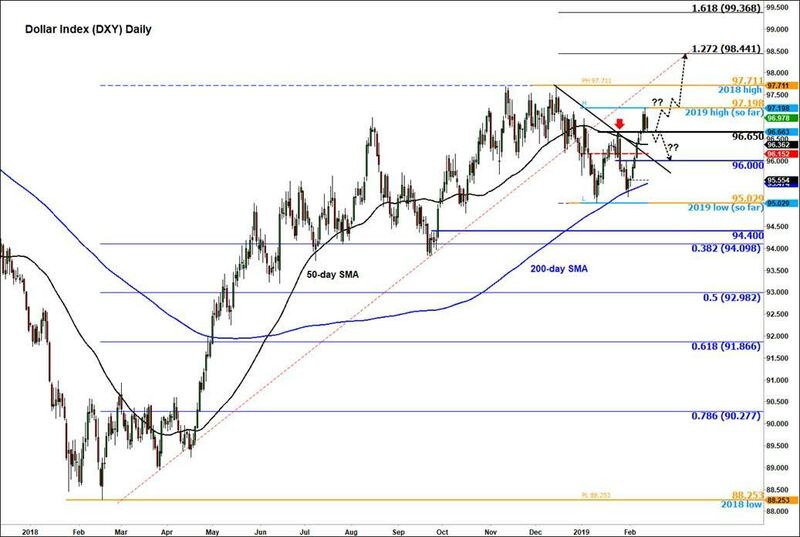 DXY: What’s next for the dollar? Despite the Federal Reserve dropping its hawkish bias, the US dollar has been quite resilient. The closely-watched Dollar Index rose for the eighth consecutive day until yesterday when it was hit by profit-taking, before rebounding again today. There are several reasons why the dollar has been pushing higher in recent times, but it remains to be seen if the rally will sustain itself, with the Fed recently signalling that there won’t be any rate rises to look forward to this year. I certainly think the dollar could weaken if and when we see a run of disappointing US macro data, a sudden improvement in global data or a breakthrough in the Brexit situation. But equally, I don’t think the dollar can rise meaningfully further unless the Fed drops its dovish bias again and talks up the prospects of further rate increases (unlikely). Some of the dollar’s strength can also be explained away by the lack of any alternative currency offering the same level of yield as the dollar. The major central banks outside of the US have remained dovish over the years and for one reason or another been unable to tighten their belts meaningfully. In Europe, persistently weak data from Germany has discouraged the ECB to raise interest rates. Political concerns in Italy, Spain and France are additional factors weighing on the Eurozone economy. In the UK, Brexit uncertainty is undermining consumer and business confidence. The Bank of England has rightly allowed inflation to rise a little above its 2% target without adjusting interest rates higher since August 2018. That was the second increase since before the financial crisis. The BoE was due to hike one more time but the lack of progress in the Brexit situation prevented that from happening. The good news for the BoE is that inflation has now fallen back below the 2% target for the first time in two years, with the latest estimate being 1.8% as was reported by the ONS this mornings. Elsewhere, the Reserve Bank of Australia has also poured cold water on rate hike expectations in Australia, suggesting that the next rate increase could be up or down, as opposed to being a likely increase previously. Regardless of how the longer-term fundamental situation plays out, in the short-term the dollar’s direction can be decided by price action around the key 96.65 level on the Dollar Index (DXY). This has been a pivotal level and with the index currently above it, the path of least resistance is to the upside. As such, a potential rally above last year’s high at 97.71 cannot be ruled out. However, should we go back below that 96.65 pivotal level then a potential drop to the next support at 96.00 would become likely.